Globalisation, advancements in technology, and ever-present social media platforms have increased awareness around personal grooming and beauty services. The likes of Instagram, Pinterest & Snapchat, provide a constant barrage of opinion and attitude from not just celebrities or fashionistas, but from friends, to complete strangers across the globe. Expectations on women to be beautiful and immaculately presented, have existed forever. But with the popularity of print magazines such as Men's Health or GQ, promoting change, we know that men are looking for more than simply meeting the minimum requirements for presentation and grooming. There is a genuine cultural shift across the world that's made image consciousness more acceptable. Once limited to a no-frills barber ‘short-back-&-sides’, a shave & on special occasions, a splash of Old Spice, male grooming standards and beauty routines are being redefined. Men are spending more than ever on their appearance, investing in stylists, vitamins and even make-up. According to a recent survey by Mozo.com.au, one in five Australian men are now getting manicures and pedicures. Men no longer deny themselves the luxuries women have long enjoyed understood, like hair colouring, hair removal and skin care treatments. From a retail perspective, this is a booming business amidst the misery of the majority of the retail industry. As a service provider that can never be replaced by online shopping, hair salons, and particularly Barber Shops are in the ideal position to grow in confidence. Hairdressing is, and always has been, considered a necessity of personal grooming. Demand for haircuts and styling is irrepressible, even during times of economic uncertainty. Capturing a segment of this $6.5 billion market, is not as simple as just opening the doors and hoping they’ll come. We know that the priority skills for those in the health & beauty industry are active listening + speaking skills and service orientation, but these must be backed up by the ‘luxury’ we see in social media. We want our lives to reflect those we see in the media and the facades our ‘friends’ allow us to see on social media. That means being seen in the right space. For a new breed of men and boys seeking vanity, that’s the barbershop. For some men, the barber shop provides a connection to community. The local High St barber provides a relaxing environment for a casual catch up on the local gossip (AKA weekend sports results) and camaraderie. Barber House in Brazil provides the ultimate destination for men to gather, for a bachelor party no less. Providing everything from packages for groups of men to share their grooming experience over a beer, to matching bride & groom tattoos. Stanford Barbers in Perth have cornered their target hipster market with the branding their space as a “Grooming Lounge”. For Pickings & Parry, their market includes the whole gamut of health & beauty and fashion in one. From the antique boy’s toys cleverly integrated, to the old school coffee and blue jeans, this epitomises the modern mancave destination. When it comes to design in Barber Shops, all are not equal. 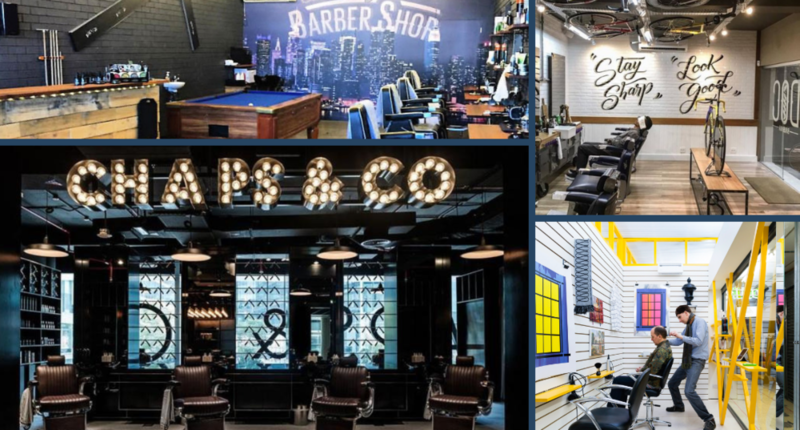 If you’re looking to launch into this booming market, or perhaps upgrade your current portfolio of barbers, you’re going to need a qualified retail design team on your side. Get in touch with us now at designdesign.biz and we’ll show you what a great barber shop looks like.